Lo is 4 months old. 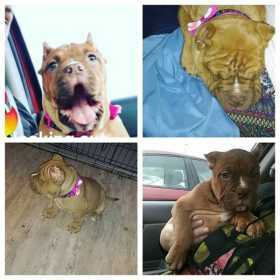 All brownish/red bully. She has a small white spot on her nose, chest & back left paw. Shes a spunky nugget. She does this bounce thing. My daughter accidentally let her out without realizing. She was only outside maybe 15 min. She is a little weird when people go to pick her up. Super sweet baby. We miss her so much.